Barclays has signed up more than 1,000 London shops to accept a touch-and-pay credit card, the bank says. Chains such as Coffee Republic and Eat will be some of the first to accept the contactless Barclaycard credit card, which will be launched in September. The idea is inspired by the Oyster payment method adopted by Transport for London, in which commuters press a small card against a special pad. The card combines chip-and-pin technology with the Oyster travelcard. The card, called Barclaycard OnePulse, can be used to pay for items costing less than £10 without using a four-digit Pin number or signing for purchases. Any transaction over £10, however, will still need a Pin to verify it. "We are excited about installing cashless readers in 25 of our London stores," said Guy Harvey, financial director at UK High Street sandwich chain Eat. "It will help us to eliminate some of the frustrations for our customers, such as queues in the busy lunchtime rush." In addition to making small transactions, the credit card is also designed to act as an Oyster card for travel on London's Tubes and buses. The bank has struck a deal to try out the new cards and contactless readers with TranSys, the company that runs the Oyster card system with Transport for London. The deal gives it the exclusive right, for three years, to put Oyster cards on its Barclaycard credit cards and Barclays Connect debit cards. The company has stressed, however, that the two types of transaction will remain separate. 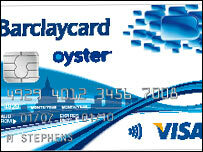 Barclays is confident that the combined credit and Oyster card will be popular, particularly in London. It says the new cards cannot be cloned or counterfeited and if a card is lost or stolen, the cardholder can cancel the card and it will no longer work for contactless transactions. But analysts have raised questions about whether security could be compromised and result in rising card fraud. Meanwhile, Visa and Mastercard will also be introducing the touch-and-pay technology in certain London locations in September for their credit and debit cards.